Nothing gets me moving like the recognition that things are soon changing. After essentially hibernating for a year, I'm going sightseeing. Burg Eltz was spectacular and beautiful but it was also a bit of schlepp to get to and I don't think Terry and the kids will care that much if they miss it. 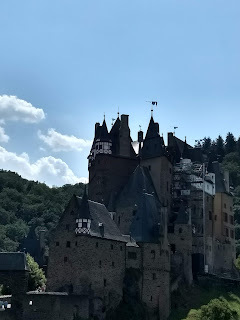 Burg Eltz is still owned by the Eltz family - more than 850 years after the first part of the complex was built! To get to the Burg* from the parking lot you can take a shuttlebus or wander for about 15 minutes through the forest. Obviously, I walked. The only way into the castle is with the tour, and they do tours about every 15 minutes. 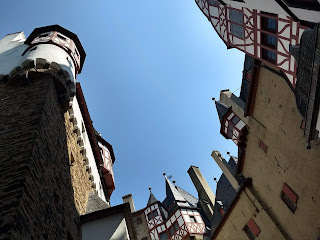 I probably missed or misunderstood some of what the tour guide was saying; between impatience and wanting to use the German I've learned, I opted for the German language tour although there was an English speaking one 15 minutes later. No photos are allowed inside the building, so 95% of what would be interesting to see is not captured. Although the first part of the burg was built in the 1100s, most of the items they had on display dated from no further back than the 1500s. There was a lot of original furniture, armament, and other household items ranging from about the 16th century up through the present day - in one room, along with 16th century portraits, is a photo of the family that could not have been taken more than 10 years ago. One portrait from an ancient patriarch noted that he lived to 94 years of age - in the 1500s! Another two rooms contain the hunting trophies, including antlers from deer, moose and elk, two enormous bear rugs with heads still attached, and pelts that had to have been wolves. The admission ticket also includes entry to the "Treasure Room". One entire wall was covered in beautiful shotguns, many with the owner's name carved or engraved in metal and with other ornamental metalwork. There was a case of swords, and one of hunting implements. Another case held a variety of small clocks, and another held various objet d'art. I guess when one family holds the old homestead for more than 800 years, it isn't too hard to go searching for antiques in the attic. * I had to look this up and was fascinated by the explanation. 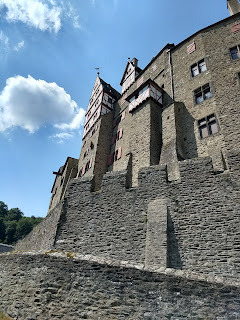 "Schloss" is the commonly understood word for "castle" in German, and this was clearly a castle, so why "Burg"? Apparently, a "burg" is a castle wherein defense is a, if not the, purpose of the building - as opposed to a "schloss" where defense was less important and a nice, solid fancy building is sought. Learning new things every day.